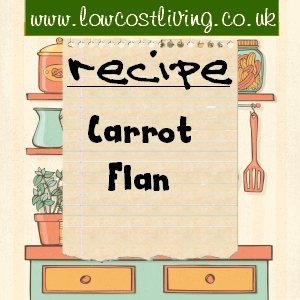 This unusual souffle style carrot flan recipe is quite easy to make and provides 4 good portions. The sweetness of the carrots is balanced well by the cheese. Do use a mature, strong cheddar or similar cheese. Preheat the oven to Gas Mark 6/400°F/200°C. Fry the onion in the butter or margarine until they begin to brown. Turn down the heat and add the grated carrots, stirring them until they soften to a puree. Add the flour and milk and stir until the mixture thickens. Add the grated cheese, salt and pepper. Remove from the heat and beat in the egg yolks. Leave to cool and then fold in the whites, stiffly beaten. Line an 8″ flan tin with the pastry and fill with the mixture. Bake uncovered for 30 minutes until the filling is well risen. This carrot flan recipe serves 4. Serve with boiled new potatoes and a salad.